Cleaning is always a task that we will never run away from, it is essential if we have to look descent. But here comes a problem, which pressure washer can we make our best? In this world market where washers are many, it is always a hard thing to make a selection. But the basic thing to do is to first make a choice of the best known brand in the market. 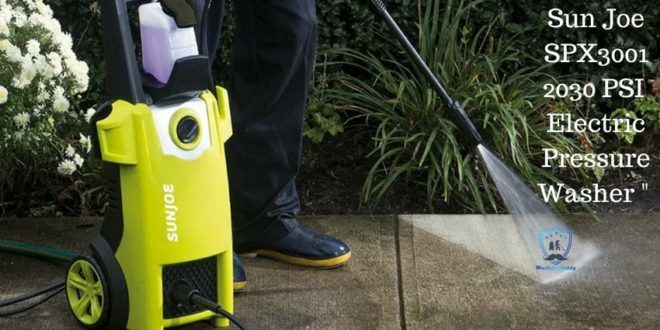 That is where you find Sun Joe SPX3001 2030 PSI 1.76 GPM Electric Pressure Washer. The company that is involved in making this product also makes its counter brother SPX3000. But should never be a problem anymore because we are going to underlying the best features that are conspicuous between the two, and others in the market. With SPX3001, you will get it right because it has a detergent tank that is worth 1.2L and an onboard hose reel which the other has not been manufactured with. With this pressure washer, you are going to find out that it produces 2030 PSI with 1.76 GPM of water flow. You will also be able to move the item freely around because of its 2-wheels. It is great product that will take less time in completing your tasks. This motor has been designed to be able to produce up to 14.5 Amp/1800 Watt power with up to 2030 PSI of pressure. To make it fast and efficient, it delivers water at 1.76 GPM so that you are able to enjoy maximum cleaning with speed. You don’t have to get worried because after doing vigorous tests around, it has finally been approved by CSA so that you have full safety while you are using it. This is the latest technology that has the ability to stop the motor by just engaging the trigger. This is a vital thing because if you want to maintain the life cycle of this product, you need to have this kind of technology with it. It will ensure that the system works better and when not needed, then engage the trigger and it will stop water flow. When you are doing your doing your tasks, you will bear with me that you need detergent. But it will be a worse thing if you need to carry it around so that you frequently add it to your tank. But with this machine, you get the detergent tank right onboard. This tank will carry the detergent with you so that you get the best usage all the time. You will use with ease the pro-style spray gun and a spray wand which have been fitted with a comfortable grip. That indicates that you are going to do your task for a long time and you will never tire off from time to time like what others will give you. With a 20ft high pressure, you will be able to wash longer distances without moving the machine from place to place. You just need to put it on a standby place and let it serve you from there. The 35ft long power cord that has been made with a GFCI plug so that you are comfortable when you are using it in a ground that is wet. This will bar the electricity from causing harm and havoc to you when you step in water around you. With the five extra nozzle tips, then you are sure to clean any surface of your choice with the right pressure. They range from 0, 15, 25, 40 and also a soap applicator nozzle that will assist you in handling light, medium and also heavy duty kind of cleaning. That indicates that you need to make a choice of the right kind of nozzle tip. You will now be able to store your hose, spray gun, spray wand, and power cord with ease. What is unique with this storage system is that you easily store your materials and when you want to remove them, it is also done in the right kind of manner and with ease. It will never crisscross each other and tie up to each matter. It weighs 32 pounds with dimensions of 14.4 x 33.5 x 16.5. with the two wheels attached to the system, you also have an easy time to move it from place to place without tiring you off. – It produces water pressure that is able to make sure that your cleaning tasks are done pretty well. From stains to grimes that have hidden in places that you could not reach. – The TSS is vital in ensuring that the machine serves you longer and better. You can stop the water flow when you are not using it. – With the different nozzle tips, you will be at liberty of making a choice of the best nozzle to use in carrying your cleaning in different surfaces. – It comes with a two-year warranty. This shows that this system has been made to last and in case you get any problem, you will be assisted at all times by consulting our experts. – Has an onboard detergent tank that will carry the detergent for your use instead of using a a bucket, which is an annoying thing to do. So, make sure that the tension that you have does never exist. Hose reel is a bit clumsy for use and also the soap applicator nozzle does not provide high pressure like other nozzles. There is no device that does not have a disadvantage, but the best thing is for you to compare the advantages and disadvantages and weigh which ones are more. This one demerit that you find might not be in a position of stopping the machine form doing its best. So, if Sun Joe SPX3001 2030 PSI 1.76 GPM Electric Pressure Washer is able to provide you a solution to your problems, why not buy it.